1-CD with 28-page booklet, 46 tracks. Playing time approx. 79 mns. 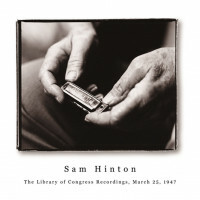 In the spring of 1947, Sam Hinton, a young folk singer made his first recordings for the Library of Congress. He recorded 54 songs that day. Most of the songs on this CD make their first commercial appearance here. They're rooted in the music Sam Hinton learned growing up in Texas. The songs include cowboy laments, prison ballads, blues, kiddies songs, old songs from Europe, and newer American ballads. Each song comes with notes from Sam Hinton. Every song, no matter how familiar, sounds fresh in Sam Hinton's reading. Sam Hinton, now 83, still performs these songs with the same vibrancy heard here, making him one of the last great reliquaries of American folk song. Born in Tulsa, Oklahoma on March 31 1917, Sam Hinton's childhood ambition was to learn every song he heard. He now has over a thousand in his repertoire. "Mama used to love to tell people how she took me to Jenkins Music Store in Tulsa [Oklahoma] when I was five years old and bought me a harmonica," Sam Hinton, now 82 years old, remembers. "And she said I was playing 'Turkey in the Straw' before we got out of the store. That was my favorite instrument. Then, for my eighth birthday my grandfather got me a push-button diatonic accordion." Sam's great-grandfather, Isham Bailey Hardy (1824-1905) was a very successful magician, puppeteer and ventriloquist who had his own dog and pony show. Although he died a decade before Sam's birth, many of the songs in Sam's repertoire came to him from his great-grandfather, Isham, through Sam's mother, Nell Duffie Hinton (1889-1978). She was a gifted musician who played both ragtime and classical piano, and taught piano and elocution. Sam remembers, "Mom wanted to go to music school, but her parents thought that as a 'Southron' lady she should go to finishing school. They sent her to Kidd Key College in Denton, North Texas. While she was there (she must have been 16 or 17) she was selected to be the representative of Texas in Chataqua, New York, as a piano soloist. My mom was raised in Gatesville, Texas, which is sort of between East and West Texas. And her parents lived for while in a boarding house [that's where she met Sam's father]. While she was there she got to know some of the cowboys, and heard some of their songs. 'Grieve, Oh Grieve' is one of them." Sam began performing in public at an early age, playing the button accordion, harmonica and pennywhistle. He spent much of his early boyhood with his mother's parents in Beaumont, Texas. When he was eight or nine years old he took his harmonica and entered an amateur contest at the Strand Theater in Tulsa, Oklahoma and won two dollars. Very early in childhood Sam displayed a predisposition towards natural history. His interest in animals (especially snakes) would continue throughout his life. "I was going to be an African Explorer, and bring home animals and things," Sam recalls. "I was kind of a hard kid to raise. Mama tried to divert me, sometimes. I wanted to catch snakes and she thought it would be nicer to raise gladiolas. I've always said my early life was divided into three periods: when Mom would let me take little snakes home, when Mom would let me take big snakes, and finally, when she gave sort of tacit permission to bring poisonous snakes home, that didn't happen until we were in Crockett. She always laughed and said I was a throwback to her grandpa, Isham Hardy!" When he was 12 Sam's family moved to Crockett, a small East Texas town. This area is rich in wildlife; the study of which, along with folk music, has been the dominant force in Sam's life. East Texas is also rich in cultural diversity, and he grew up hearing music in the traditions of African America, the White South, the Cajun French, the American West, and the Anglo-Celtic mountain tradition of settlers from the Ozarks. In 1929 Sam's older sister Mary Jo gave him a copy of Carl Sandburg's new book of folk songs, 'American Songbag.' He already knew many of the songs in the book, and he soon learned many of the others. (Of the 54 songs he recorded for the Library of Congress, 13 are published in 'American Songbag.') Sam remembers, "I took that copy of American Songbag with me to college and on the road with Major Bowes. I read it cover to cover. When I read that book I finally realized what I did was folk music. I used to work out tunes in the 'American Songbag.' With long study I could figure out pretty much the gist of the melody. My sister Mary Jo was also supportive of my interest in snakes. She gave me a book by Raymond Ditmars that I still have, 'Snakes of the World.'" Sam's search for new and different snakes led him into Crockett's rural black community, where Sam learned songs and hollers from local sharecroppers. Crockett had a large black community, and the local black church was another source of songs for young Sam. In 1934 he got his first guitar. "I'd heard Jellyroll Roberts play the 'Spanish Fandango,'" Sam reminisces. "He wasn't a special friend of mine, but he was the only person I knew in Crockett who played the guitar. I've often said that when I got my first guitar it was easier for me to learn to play because I had nobody to compare myself to. I was 19, and whatever I could do sounded good to me. But I think my guitar playing is something I just worked out for myself. "Rollins Colquitt was one of my roommates in the Texas A&M [Agricultural and Mechanical College] dormitory, and he said he had an old guitar at home. He brought it into our room just before the end of our freshman year. The idea was, I was to learn to play it over the summer and when he came back to school the next fall show him how to play it. Well, I went into a music store in Houston and asked for a book on how to play the guitar. I was just lucky they gave me one about how to play with fingers, rather than a flat pick. I'd be a flat picker if I'd gotten the other kind of book." Sam lightly fingerpicks the guitar in a syncopated style, with his fingertips, while achieving a backbeat strum with the back of his middle fingernail. According to Sam, "My mother loved to play ragtime, one of my favorite pieces was the 'Maple Leaf Rag' [by Scott Joplin, published 1899]. That gave me the feeling, I think, for syncopation, but I didn't know that at the time. I think what I sensed in ragtime was that the left hand was doing a pretty steady beat, and the right hand was playing a lot of offbeat things. And I think that carried over into my voice as one part and the guitar as another, doing some offbeat things with one or the other." Sam worked his way through college as a musician, sign-painter, calligrapher, scientific illustrator, and supplier of snake venom to the Sharp and Dohm pharmaceutical firm in Pennsylvania. In 1935, while studying zoology at Texas A&M, he was invited by folklorist J. Frank Dobie to give his first performance as a folksinger; a lecture-recital of East Texas Folk Songs for the Texas Folklore Society at the University of Texas in Austin. Customer evaluation for "The Library Of Congress Session,March 25,1947"